Of the approximately 545 children in foster care in the Cedar Rapids area, roughly 40% are teens. Every year, at least 25 of these teens turn 18 and graduate from high school while in the foster care system. These teens often lack the support and resources that young adults need to live independently. To fill this important need in the community, JLCR announces its new project: Bridging the G.A.P. (Guide. Advocate. Provide.) 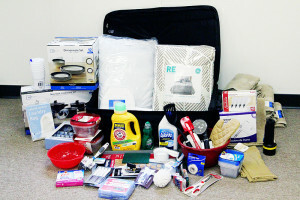 JLCR will fill suitcases with items necessary to live independently such as bedding, pots and pans, and cleaning supplies. The project will also partner JLCR with AMP (Achieving Maximum Potential), a program that empowers young adults by supporting the development of life skills. JLCR women preparing a meal for an AMP meeting. GUIDE. JLCR empowers foster youth through the development of life skills. JLCR and Foundation 2 partnered to connect JLCR members with the Partnership of Iowa Foster Care Youth Council’s Achieving Maximum Potential (AMP) local group. As a result, JLCR members and AMP participants interact on a twice-monthly basis, developing bonds between adults and the teens. 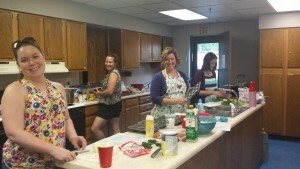 At bi-weekly AMP meetings, JLCR members present on life skills, provide a healthy meal for 30 adults for less than $100, and connect with AMP participants on a one-on-one level. Prior to the development of this partnership, AMP participants often would choose to skip dinner to attend the meeting. JLCR members have presented on topics that range from developing a responsible online presence to selecting colleges or future careers to media literacy. ADVOCATE. JLCR supports efforts to ensure that youth aging out of foster care have the opportunities and services essential to live independently. Further, JLCR sees value in supporting and promoting court-appointed volunteer advocacy for foster youth. JLCR developed a fall speaker series in 2011 that featured presentations by U.S. Senator Charles Grassley, State Representative Renee Schulte, foster parents, AMP participants, foster care alumni, judges, Four Oaks/Iowa KidsNet staff, Foundation 2 staff, and Court Appointed Special Advocates (CASA) volunteers. 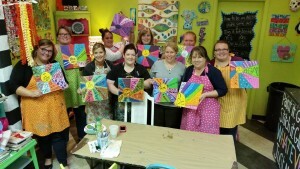 Advocate committee planned an AMP art project at the Dreaming Bear to continue telling stories that our community can see in an effort to keep helping those in foster care and recruiting foster parents. An example of the suitcases JLCR makes available to local teens aging out of foster care. PROVIDE. 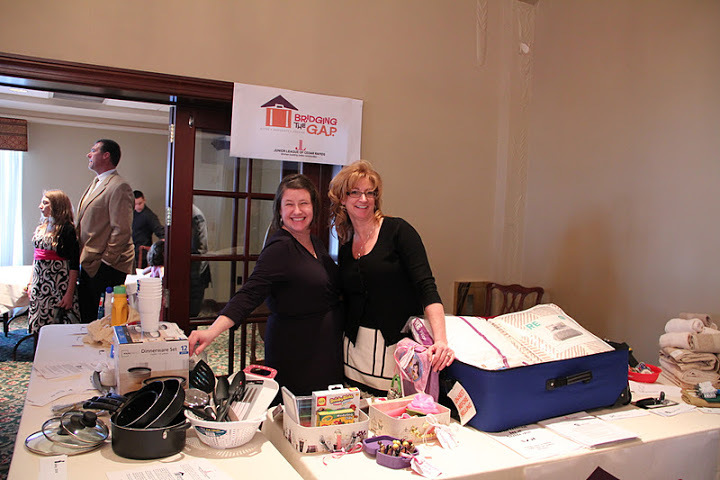 JLCR contributes suitcases with items foster alumni need to live independently. JLCR has provided more than 25 suitcases for youth aging out of the foster care system. These suitcases include bedding, kitchen utensils, cleaning supplies, pots and pans, and towels. As of November 2012, JLCR has provided more than 100 suitcases for youth within the foster care system. These children now move between foster homes with dignity, carrying their belongings in luggage rather than in garbage bags. Please visit Make a Gift to help fill the suitcases and support this important project. Junior League of Cedar Rapids thanks TransAmerica for its support of Bridging the G.A.P.